With a view to facilitating homebound clearing, the Bank made arrangements with a number of exchange companies during the year. This arrangement brought significant development in clearing business. NCC Bank is going to expand this network in near future. Corporate Governance establishes specific responsibility to ensure accountability. With a view to ensuring accountability and fairness in functions of the company d also to comply with the requirements of regulatory agencies, care has been : to improve Corporate Governance. Due to these practices the remittance c of NCC Bank has been growing to provide a good participation in the ‘ of the Bank. For any business school student only curriculum activities are not enough for handling the real business situation. So it is an important opportunity the students to know about the field of business through the internship program. Internship program is a perfect blend of the theoretical and practical knowledge. This report is originated to fulfill the requirement of the assign project internship report on “Clearing Formalities through Bank: Study on A NCC Bank View” which has been assigned by NCC Bank. In this regard, I have been iorking as an internee in NCC Bank Limited, Clearing department, Head Office. haka from October 13, 2009 to till today. During this period I learn about the remittance payment. On the basis of working experience for this period I have irepared this report and I have tried my best to relate the theoretical knowledge ith the practical work situation. This report has been prepared on the basis of experience gathered during the eriod of internship. Within this period I visited one department namely FRPP department. National Credit &Commerce Bank Limited is one of the well-known private commercial bank in Bangladesh. Its public reporting system is appreciable. Data s managed in well manner. Data arrangement is logical that helps in easy application of analytical tool. Statistical tools and much graphical presentation are used for performance analysis. For preparing this report, I have also get information from annual report and website of the FRPP, NCC Bank. I have presented my experience and finding by ..sing different charts and tables which are presented in the analysis part. Study of different files of different section of the bank. Producer manual published by the NCC Bank Ltd.
With the growing competition among nationalized, foreign and private commercial banks as to how the NCC bank operates its foreign remittance ayment project and how customer service can be made attractive, the expectation the customers has increase. NCC banks are trying to evaluate their traditional banking service to a better standard, to meet the challenging needs. So they should pay attention on better performance and existence. NCC bank is :ne of the private commercial banks to focus its attention towards the improvement, who are actually executing the policies undertaken by the top anagement will have a chance to communicate their feelings and will have the feedback about their dealings from the customer. o this office. The report covers its overall activities, function, structure and :erformance. To conduct a study on what is FRPP concept (NCC Bank) I have gathered valuable information from FRPP office, NCC Bank Limited. I have also got some nformation from web site. I have also collected much information from its employers. I had to face many different problems while preparing this internship report. At same time I tried to make an adjustment with those problems. It was very hard to collect the information from various personnel for the job constrain. Bank policy was not disclosing some data and information for various reasons. Because of the limitation of information some assumption was made. So there may be some personal mistake in this report. The time 2 and half months only, which is insufficient to know all activities of the FRPP office are prepare the report. Lack of opportunity to visit more than one branch. Main Share Holders MAIN SHARE HOLDERS Main share holders comprise leading industrialist and business magnets of the country. 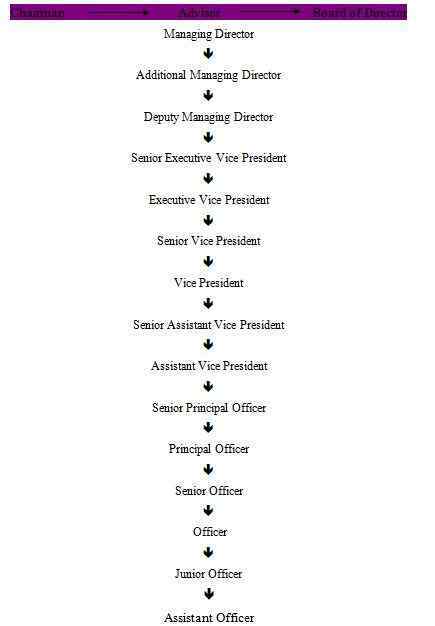 The board of directors consists of 14 members. Most of the directors are owners of large of business groups having high net worth. 2.1 HISTORICAL BACKGROUND OF NCC BANK LTD.
To become the Bank of choice in serving the Nation as a progressive and Socially -supposable financial institution by bringing credit & commerce together for r and sustainable growth. To mobilize financial resources from within and abroad to contribute to Floricultures, Industry & Socio-economic development of the country and to pay catalytic role in the formation of capital market. The bank is started with an authorized capital of TK. 1000 million while its initial paid up Capital was 1K. 250.00 million subscribed by the sponsors in the year 1999. The Capital and Reserve of the Bank as on 31 December 2006 stood at Tk. 3200.68 million including paid up capital ofTK.1800.61 million.  The main task of the NCC Bank is to accept deposited from various Customers through various accounts. The Bank invest it fund in to profitable sector.  The Bank is doing the transaction of bill exchange, Cheque etc.  NCC Bank assists in the foreign exchange by issuing letter of credit.  It brings the increasing power of the dimension of transaction. (d) Performance of the bank: Deposit various setbacks in economy. Banks rformance may be termed as satisfactory in respect of deposit mobilization & profit earning. At the end of the year 2008, banks operating profit stood at tk. 2.18 Automation in NCC bank Ltd.
Cash, l2.50°/o Bonus) for its valued shareholders for the year 2006.  Purchaser must be an accountholder of JBL. But in special cases job seeker and student can issue a pay order from this branch.  Client first deposit the money with P.O application form.  Next officer give necessary entry in the bills payable register.  Then prepare the P.O instrument carefully.  After that it has been sign and approved by higher authority.  Signature of customer is taken in the counter part of the instrument. Fin ally it delivered to the customer.  By transfer of money. # JBL General A/c ………………..Credit.  In case of Demand Draft both the payer and payee need to maintain accounts. But there is no certain rule for pay order. 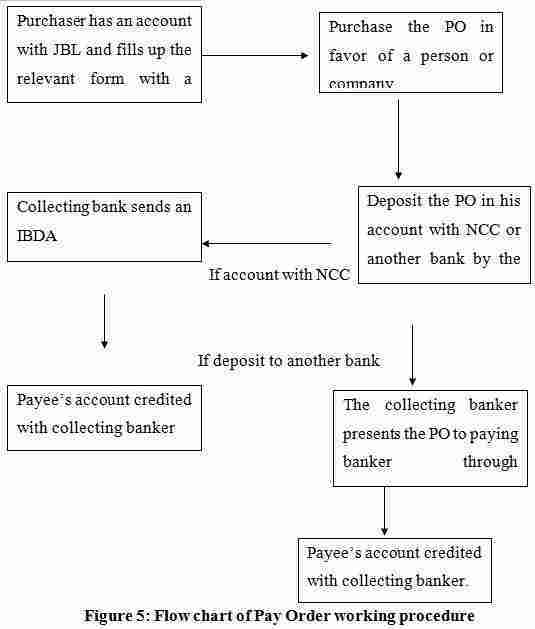  PO is used in the same remittance area; DD is used for all kinds. DD cannot be done in the same remittance area.  DD is drawn on a certain bank office. But there is on certain rules for PO. 2. External Remittance or Inter-Banks remittance. ► Open cheque: A cheque, which capable of being paid over the counter in cash, is known as open cheque. ► Crossed Cheque: Those, which can only be paid to the banker for crediting the proceeds to the amount of its payee. □ Insufficient funds / not arranged for. □ Drawn against uncollected funds. May be presented again. □ Amount in words and figure differ. □ Alternation requires drawer’s full signature. □ Mutilation required drawer’s confirmation. □ Cheque postdated /out of date. □ Payee’s endorsement required / irregular. □ Payee’s endorsement requires bank confirmation. □ remittance house stamp missing. □ not drawn on us. □ Effects not cleared pls. Present Again. Naturally remittance system have been completed by 3 or 2 days. Initially this is long term process for us. We want to make reduces the time. There have condition apply .  If BD Bank is created fund that be used all private bank by the `On Line`.  If BD Bank is wide spear to remittance house . a The Bank provides better quality foreign remittance payment service to the clients compared to its other contemporary competitors. • Energetic as well as smart team work. management of the Bank, which formulates business strategies. • Cooperation with each other. • Some services of the Bank are automated which attracts large number of clients. • The bank has earned customer loyalty as organizational loyalty. • Usage of faster PC and software. • National Credit and Commerce Bank Limited has already achieved a goodwill among the clients that helps it to retain valuable clients. • The bank does not go for rural banking. But rural people are bankable which NCCBL get from the activities of the NGOs. • Sometimes create misunderstanding with NCC bank and TMSS which create remittance payment is complex. • The Bank lacks aggressive advertising and promotional activities to get a broad geographical coverage. • The bank has only a few ATM booths but not in mention able places. So, the scope of the use of ATM card is limited. • There are few employees in FRPP section. assuring the remitter for their service. • Scope of leading the foreign remittance payment market. • Real time online banking. • Increased competition in the market. • Lost expert employee by offering other bank. • NCC Bank could give more attention to advertisement and promotion of foreign remittance payment service, which is helpful to get more customers. Bank could use various media for advertisement like TV, News Paper, Internet and Billboard. • A philosophy of working for the customers instead of working for boss must be introduced. • A website should be more attractive and have more information in it. Also it should be uploaded regularly. • Up to date banking software should be use to give batter service to the customers. • Manpower should be increase in REMITTANCE section.